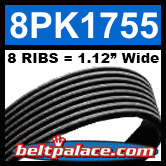 BANDO 8PK1755 EPDM Serpentine Belt: 1755mm x 8 RIBS. HEAVY DUTY Automotive Serpentine Belt, PK (K) Section. Metric 8PK1755 Serpentine Belt. BANDO USA “PK” Premium Series Automotive Serpentine (Micro V) ribbed belts are designed to replace OEM belts on extra heavy-duty passenger car and truck applications.